Howard Barker is looking startled. “I’m amazed, why would you leave?” I have just told him about the reports of early walk-outs in response to his claim that his play Scenes from an Execution is an easy ride. He looks genuinely baffled, and says: “It’s a pretty easy play to get on board with, it doesn’t give you a headache”. Want more? Here we go. 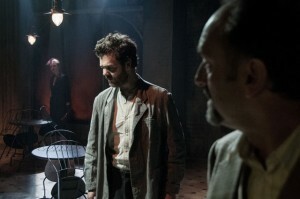 Howard Barker wants theatre to be an ordeal but this polished production by Robyn Winfield-Smith is anything but. Winfield-Smith encases Barker’s meaty poetry in cool performances and keeps this philosophical piece to a tight tempo. Lot and his wife have been told to pack their bags by the angel sent to destroy Sodom. Justin Avoth as the avenging individual burns with a fierce intensity that makes his own descent into Lot’s wife’s bed even more acute. Mark Tandy’s Lot is more circumspect, he is cool in the face of his impending fate, both interrogating and searching to understand God’s will. Hermione Gulliford as Sverdlosk – “the wife of Lot has her own name incidentally” – is as poised as a ballerina en pointe. Her intelligence is sharper than her designer suit but she does not use it to manipulate – her betrayals are sacrosanct because they are sanctioned by her husband, just as the angel’s are by God. Barker’s language rolls around the space, verbose but lyrical. Winfield-Smith has punctuated his free-wheeling speeches perfectly – pointedly maximising their force. Keeping within The Print Room’s tradition of beautifully designed productions, Fotini Dimou has created a fine podium for these meditations to be played out on. Runs until 24th November. For more information go here.